Bring nature indoors! 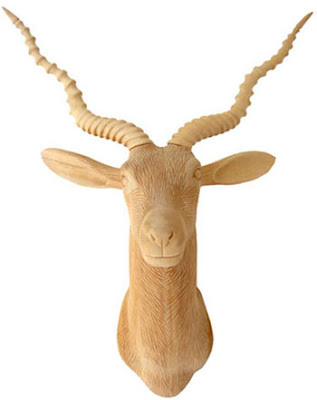 The Capricorn is a finely articulated trophy heads. These striking wooden animal wall sculptures are entirely hand crafted. Since each of these animal-friendly wall sculptures is hand made, they reveal exquisite hand-carved details. These modern trophy heads are highly decorative in form and are a great addition to your home decor. The Antlers of the Capricorn can be removed for easy shipping. These animal trophies are very easy to attach to a wall. The back of the sculpture has a keyhole hanger allowing easy installation. These captivating trophy heads will look grand in both traditional- and modern homes.